Nobody likes being sick, and going to the doctor is never fun. But there’s a new fear of walking into the physician’s waiting room that’s different than ever before—and it’s only going to get worse. Many physicians are seeing what I am—a growing number of people who are coming to see us after many days or weeks of being ill. To be honest, some are risking their lives by not seeking help sooner, but they just can’t bring themselves to do it. Years ago, insurance companies needed to reduce utilization. That means they didn’t like how often you were going to the doctor. To make you go less often, they increased your co-pay and made it financially painful for you to seek medical help. Remember that? Your co-pay has been climbing over the past decade, and that’s the reason. It’s the insurance company’s way of controlling how often you see your doctor. But since the advent of Obama Care, the insurance industry has devised a new way to reduce how often you see your doctor. They have not only increased your co-pay and required your physician to collect it at the time of service—they have also begun a new practice without telling you or us about it. The next time you have a sore throat or a cough, don’t be surprised if the young lady at the front desk pulls up your national database clearinghouse records and tells you you’re required to pay much more than you have in the past—more than just your co-pay. The reason for this is that the insurance companies feel that you’re still going to the doctor too often. They really don’t want you doing that, especially if you’re sick. For that reason, they’re making sure you pay everything possible up front. In other words, instead of just your co-pay, you may be required to pay your entire deductible for the year—up front—at the front counter. At the registration desk, if the young lady doesn’t collect what the database clearinghouse says you owe on your deductible, the insurance company won’t pay your doctor one single dime. It doesn’t matter they owe it to him—they just won’t pay it. Instead, the insurance company will sit on that money that you relied upon as a benefit, and refuse to pay your doctor—anything. Sound like socialized medicine to you? Patients are upset because this practice of collecting all of that money came out of nowhere, they can’t afford it, and they may believe their doctor is just being greedy. But that’s the beauty of it. The insurance company puts the unpleasant burden on your doctor. In fact, he is required to do it. 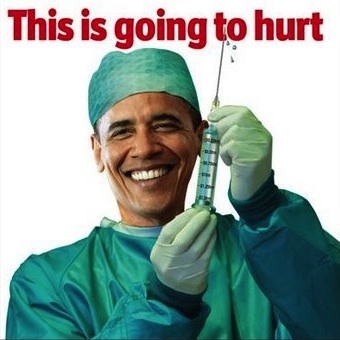 This is just the first wave of cause and effect from Obama Care, and it’s just the beginning. Your doctor isn’t doing this to be greedy—he/she’s just trying to get paid something by the insurance company for that visit. I will say it again—if the medical office doesn’t collect your deductible up front, the insurance pays the doctor nothing, and the visit is performed for free. How long do you think he/she can do that? One reason this may have come out of nowhere is that the insurance companies never told the doctors they were going to do this. They just waited until the blowback and fallout hit the fan. That way, they kept their money longer. Just one more thing hidden by the Obama shroud. From a practical standpoint, the overall effect on healthcare is tragic. You don’t want to go to the doctor even when you or your kids are sick because of the cost. And more doctors are quitting because they don’t want to be part of this ridiculous, downwardly spiraling debacle called Obama Care. For more on that, read Why Doctors Are Leaving Medicine Over Obama Care. The doctors that are still trying to provide the best possible care are trying to make this process as efficient as possible, and to be there for you. Regardless of what you may hear from the Obama administration, physicians are in the business of helping others. We’ll continue to do everything we can to provide the highest quality medical care. Please remember, don’t let the government tell you to stay home when you’re sick. Your health is too important to take chances, and we’ll get through this together.